News | Top Shelf Canadiana (real and fake) in the Montreal Gazette! Canadian journalist Ian McGillis has a new piece out in the Montreal Gazette highlighting 2009's best graphic novels... including two Top Shelf titles! First, Jeff Lemire's Essex County "achieves an epic sweep even though it’s relatively light on text" and "packs an enormous emotional punch." 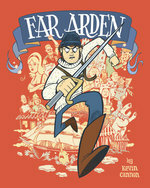 Then, Kevin Cannon's Far Arden serves as "an odd but effective cross of contemporary nerd-hero comix with Tintin-style exotica" which "zips along with manic logic." For more on these two books, check out the links below!